In Fiery Protest, Italian Museum Sets Art Ablaze In Italy, the budgets of state-run museums, archaeological sites and libraries are among the hardest hit by the government's tough austerity measures. 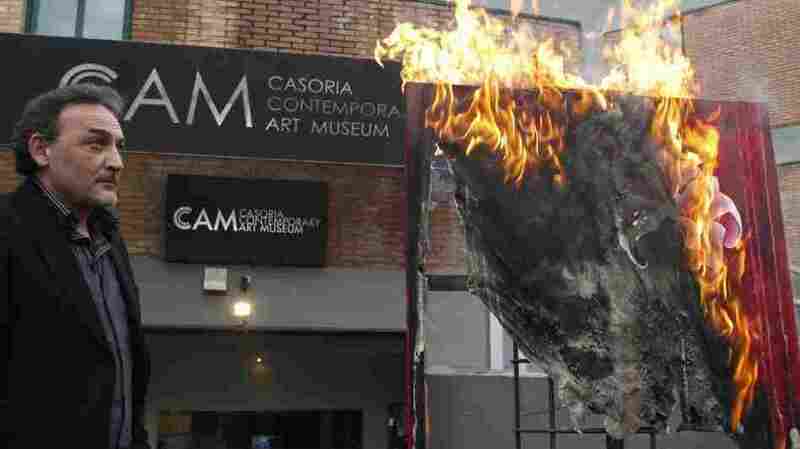 One museum director is protesting by systematically burning pieces from his museum. Casoria is a small town in the Naples hinterland known mostly as a hotbed of the local mafia. But last month, it achieved a different kind of notoriety when Antonio Manfredi, director of the Casoria Contemporary Art Museum (CAM) launched his provocative challenge to the Italian Ministry of Culture. Manfredi's "art war" consists of setting works of art on fire to protest cuts to Italy's arts budget. He's pledged to incinerate two or three pieces of art each week from a museum collection housing about 1,000 exhibits. Like its debt-burdened southern European neighbors, Italy is struggling to pay back $2.5 trillion in debt through relentless belt-tightening austerity measures. The budgets of state-run museums, archaeological sites and libraries are among the hardest hit. Despite a tremendous art heritage stretching from ancient Greek and Roman sites through the art and architecture of the Middle Ages, the Renaissance and the Baroque period, modern Italy has traditionally invested little in the arts. Arts spending makes up barely three-tenths of 1 percent of GDP — just one-fourth of what is spent on the arts by France, England and Germany. "This is war for the arts, so this is I think really one art revolution," Manfredi says of his protest. "We want the institutions in Italy and around the world to understand that the culture is very important," he says. "And it's not possible when there is an economic problem in the world, [that] the first that the government destroys is the art." Italian arts institutions, like Rome's MAXXI museum of contemporary arts, have been hit hard by funding cuts in recent years. Manfredi began his protest with his own pieces, and then — with the artists' permission — he began burning works by others. "When I burn one artwork I feel very, very bad. Because each one piece in this museum is one part of my life, is one part of the life of the artist," says Manfredi. "But when the revolution is possible only with the burning action, we destroy some art to save all art." The Casoria Contemporary Art Museum opened seven years ago as a city-owned museum. But soon after, the municipal government was disbanded for mafia infiltration. Since then, Manfredi has depended on private sponsors — but the recession has dried up that source of funding, as well. Manfredi has also received threats for staging exhibits denouncing the local mafia, or Camorra. Manfredi says his radical approaches are not just about funding, but also an appeal for moral help and attention from authorities. So far, he's received no official reaction. But Manfredi's bonfires have sent sparks around Europe, garnering solidarity and igniting similar protests in artist colonies in Germany, Wales and England. A video shot at the AirSpace Gallery Studios in Stoke-on-Trent in the U.K. shows artists dropping canvasses into a crackling fire. Speaking into the camera, an unidentified woman says, "We are standing in solidarity with Antonio Manfredi in protest against cuts to the arts." But in Italy, Manfredi has received little media coverage, and some art critics dismiss him as an "adolescent exhibitionist." "It's such an extreme gesture, the idea of setting a work of art on fire gives me goose bumps," says Anna Mattirolo, art director of Rome's MAXXI contemporary art museum. "But there's no question about it," Mattirolo adds. "Arts funding cutbacks have been devastating." 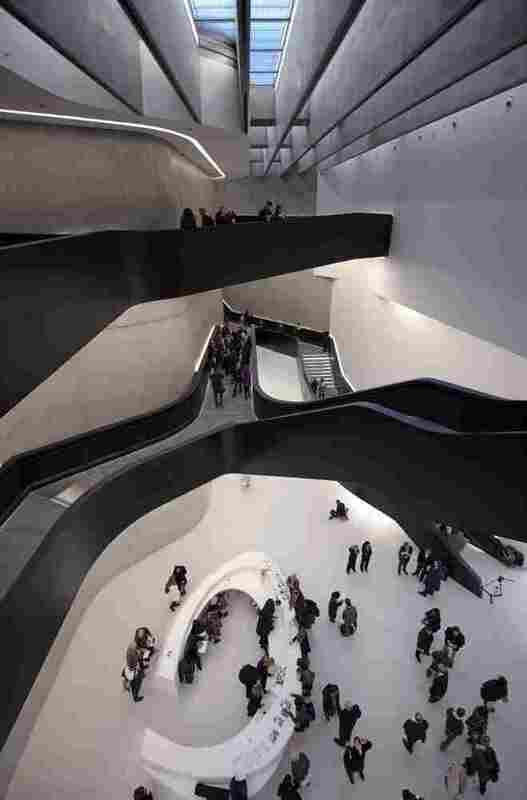 Earlier this month, the MAXXI Museum, designed by the Anglo-Iraqi architect Zaha Hadid and inaugurated just two years ago, was placed under special administration after it was revealed that its 2011 accounts had a $1.1 million shortfall. Italian government spending on the arts has been slashed by some 76 percent over the past two years. The effects were immediate. In Naples, the Madre Museum had to close two floors. In the northern city of Trento, the contemporary art gallery is on the verge of being shut down. And many museums are being forced to cancel long-planned exhibits and exchanges. Mario Resca, head of the Culture Ministry's department of arts promotion, points out that during the recession — when people don't have money to buy gasoline — the number of visitors to museums and archaeological sites is actually growing. Resca looks to the Greek philosopher Aristotle to explain the phenomenon. "He said that during successful period[s], culture was an ornament," Resca says. "In bad periods, culture is a big shelter. "Maybe it's a way to get back to earth, maybe new energy, new ways of thinking, new values would come out," Resca adds. But thus far, the Italian government has remained silent.